Arsenius of Ninotsminda was an ascetic who labored in the 11th century. History tells us that he was a brilliant translator, writer, calligrapher, and theologian, and indeed one of the greatest Church figures of his time. St. Arsenius was tonsured a monk in Jerusalem, and after some time he returned to Georgia, where he was consecrated bishop of Ninotsminda. But the venerable Arsenius longed to lead a life of solitude, so he approached King Davit Kuropalates for permission to resign from the bishopric and settle at a monastery. The king honored Arsenius’s request, and the pious man set off for the monastery with John Grdzeslidze, a man of letters and another great figure in the Church. When the news of his decision reached the Iveron Monastery on Mt. Athos, Sts. John and Ekvtime invited the fathers to Mt. Athos, and the next year Arsenius and John arrived at the Holy Mountain. There they assisted St. Ekvtime in his translations of the Holy Scriptures and many theological books. 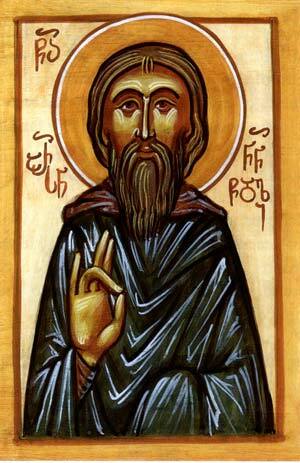 St. Arsenius labored fruitfully at the Iveron Monastery for many years and reposed peacefully at an advanced age. He was buried on Mt. Athos at the monastery’s church of St. Simeon the Stylite. St. George of the Holy Mountain later translated his relics to the ossuary of the monastery’s catholicon.